Boulder’s Arcana Restaurant opened just over a week ago, and it is VERY Good. We’ve had the chance to visit lots of area restaurants shortly after they’ve opened, and they almost always have quite a few hiccups in the first few days of operation. Servers may not be familiar with the whole menu, incorrect dishes might be served, timing can be off, etc. We visited Arcana on the first Saturday it was open, though, and the food, the service, and the overall experience were all impeccable from start to finish–no hiccups whatsoever. There are a lot of “New American” restaurants in Denver and Boulder these days, but Arcana restaurant takes a somewhat different approach to American cuisine. Rather than focusing on what’s “new” for the future, Arcana creates dishes inspired by the country’s past. Nearly everything at the restaurant is made from scratch, including the bitters the bar uses in its cocktails (which, by the way are delicious). Fermenting, ember-roasting, and pickling are just a few of the techniques Arcana employs to create bold, unusual, and mouth-watering flavors. The plating technique is beautiful, and you can tell that husband and wife owners Elliott and Annie Toan put an enormous amount of love into the crafting and execution every last detail of the restaurant. One common pitfall that can cause new restaurants to experience growing pains when first launching is offering a large and complex menu right out of the gates. Arcana avoided this temptation, though, opting instead to open with a focused (and delicious) ten-item dinner menu, with each dish executed to perfection. In the coming weeks the restaurant will be adding several dishes to its menu and will eventually feature a new dish each night. 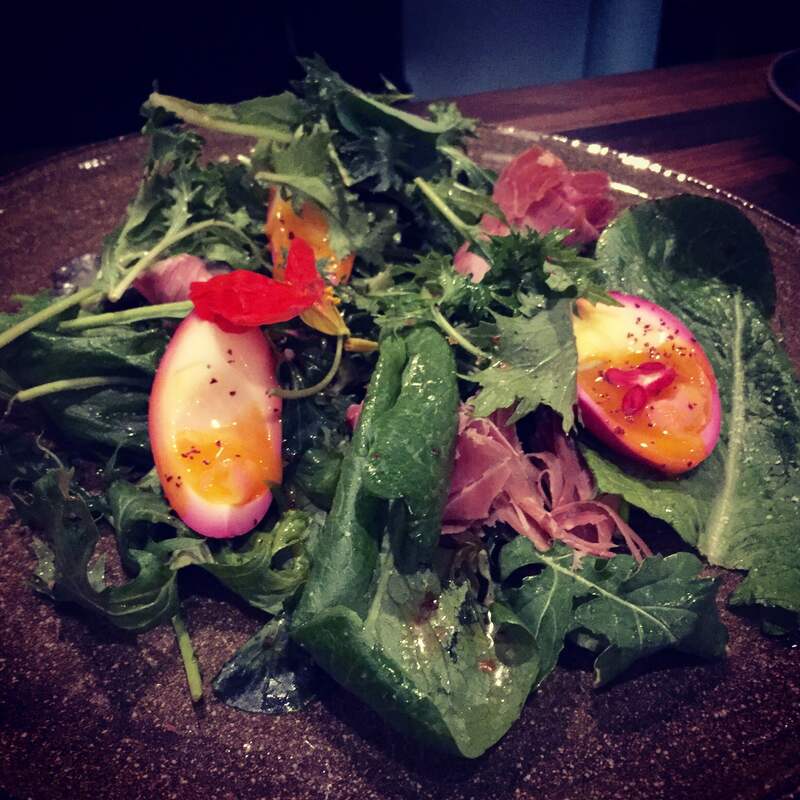 The Oxford Greens with pickled egg, ham, Aleppo chili, wild flower, and sumac was bright and refreshing. The Shawnee Cake was the highlight of our night–a cornmeal based griddle cake was topped with easily the best crispy pork belly I’ve ever eaten in my life, fermented chili, green apple, and yogurt. The Colorado Trout was tasty with fire carrot, carrot top pesto, crispy onion, chili, and buttermilk. The Capped Pork Loin was excellent and perfectly salty, served with a mouth-watering pork sausage (made with house-made fermented chilis), lacinato kale, kabocha squash, and house-made crème fraîche. For dessert, the carrot cake with maple, hibiscus, burnt tangelo, and ginger ice cream was absolutely divine–we only wish that there was more of it. The same goes for the layer cake with brown butter, chocolate, compressed apple, whiskey, and quinoa ice cream. Arcana is located at 909 Walnut St. in Boulder.